I realized that it's been almost exactly one year since I went on my first long-distance roadtrip, and so I'm posting my notes from that this week. It was a trip to New Orleans with stopovers in Memphis and Washington, and we had a blast, so I think it warrants reposting. Roger and I drove 18 hours yesterday, through ten states (New York, New Jersey, Pennsylvania, West Virginia, Ohio, Kentucky, Indiana, Illinois, Missouri, Arkansas and Tennessee) yesterday, and finally arrived in Memphis at 2am (1am Memphis time). The drive was exhausting, yet exhilarating (Roger), and taught us the value of new American cities (Kristin). Our first interesting sight was a horse-drawn buggy with Amish people somewhere in Pennsylvania, a few miles away from the Roadside America. We didn't stop at Roadside America, or at the World's Largest Big Mac, because it turns out that Memphis is actually 18.5 hours away, not 14, so we were in a bit of a rush. I think I'd like to do the drive again, maybe with Rowan Oak as a destination (because it's closed on Monday, which is tomorrow, when we pass it, and I'm a little heartbroken), and taking some more time to make the drive and see more than just fields on the little highways we took. Passing Cincinnati was my personal first experience with a really new-looking city, and I liked it a bit. It was interesting to me to see that, compared with New York and Philadelphia and all the other really old or really run-down cities I've seen. It seemed full of possibilities and so far, this trip has really made me consider the idea of getting the hell out of New York and out of the New York centric publishing world. We stopped at Big R's Barbeque in La Grange, KY. We wouldn't recommend the restaurant, and we should have gone to Cracker Barrel instead (Roger), but the town was really sweet, and had the added bonus of having a train run directly along Main Street, which was awesome to see. (I should note that Roger, my travelblogue partner, and, if you're really thick, lover, has fallen asleep, thus ruining my latest blog experiment, partner-blogging, and meaning that from here on out, this is more of a Small Review than a Joint TravelBlogue, from my perspective.) Again, we were four hours behind schedule, and rushed out of town to get back in the car. The rest of the trip to Memphis was uneventful, and eventually, dark. Roger and I bickered about music (we listened to Lily Allen's It's Not Me, It's You four times yesterday, and Lady Gaga's album twice, and when I drove, I wanted to change the XM radio over and over, or just listen to 50s on 5), bad habits (my sniffling all the time instead of blowing my nose and his chewing on his fingers) and driving (neither one of us is very good at it), and finally arrived safely at Kings Court Motel early this morning. The hotel itself has a great location, and is totally clean, so I'm deeply impressed. Today we slept late (7:45am for me, 9:30am for Roger) and spent the morning at Graceland, which was bizarre. I think Roger and I both agreed that Elvis had really, really poor decorating tastes, although we loved his pool room, which featured folded cloth all over. We thought that the cleaning, if done up in wax print, might look nice in a library. We ate lunch at Gus's World Famous Fried Chicken, which was really very good. It's unassuming and delicious, and we would never have stumbled upon it if we hadn't read about it earlier today. I'd recommend getting the potato salad instead of fries. (Just FYI, we're eating dinner at Dyer's. Deep fried burgers? Hell yes. Oh my god, worst vegetarian ever.) After that, we checked out the National Civil Rights Museum. It was an excellently planned museum, located inside the Lorraine Hotel, and in the boarding house across the street. It was accessible, but very thorough, with a variety of interactive exhibits. I was impressed with an exhibit giving evidence and arguments for three different investigations and conclusions in the murder of Dr. King, with the instructions to "decide for yourself." Our only complaint (Roger is awake now, and telling me his hands are asleep and feel like jelly) was that it only covers black rights, which is hugely important, but not necessarily the only civil rights struggle that could have been covered. Tomorrow, we take New Orleans. 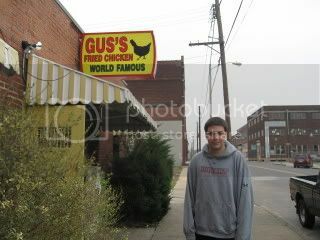 Gus' Fried Chicken! Jessica and I went there, too! So good! I am so happy that you told me about these posts because I have loved reading about your time in New Orleans (I have also been reading the posts in reverse order, which is why I am commenting on this one haha) but I got really excited when I saw you mention Roadside America!!! My hometown is about 2 hours away from there, and my family always passed by Roadside America when we drove to visit relatives in Allentown, where my parents grew up. That place has been around forever, in fact my mom used to take field trips there when she was in school. One time Ian and I let curiosity get the best of us so we decided to stop. If you're ever up that way again, you gotta do it just to say you did. It's the world's largest indoor miniature train village and it's super kitschy (but actually pretty impressive!) I actually wrote an article about it for Penn State at http://pabook.libraries.psu.edu/palitmap/Roadside.html if you are interested haha.